Give us a hand to help mother nature give again. Our Green Energy Movement welcomes environmentally conscious people all around the world to help accomplish the expansion of renewable, clean energy. 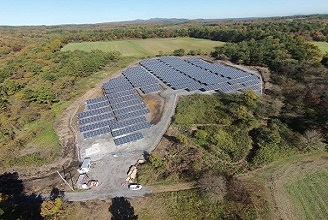 With your donation, With your donation, you can help us install natural energy power plants. The fund raised from the systems allows the Movement to expand, helping us realize eco-friendly, sustainable power generation. 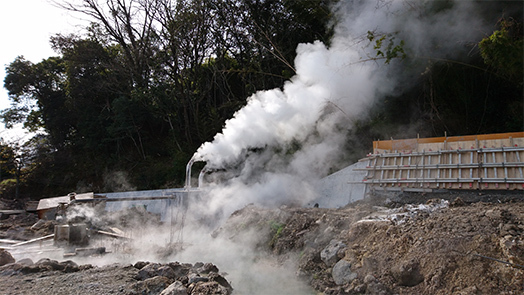 With your donation to this Movement, you can show you care about Earth by participating in sustainable power generation as a proud contributor to a geothermal power plant located in Minami-tateishi, Beppu-shi, Oita. The plant makes use of the characteristics of geothermal heat, so that regardless of the weather conditions, it can sustain power generation for 24 hours, despite that the generating power is as small as 50 kilowatts. It is planned with a capability to generate about 345,000 kilowatts hours per year. (From February to December, 2016) The names of donors who donated to the plant in 2017 will be shown in September 2018. I heard about this movement from a friend. I'm not a SNI member, but the idea of this movement resonated within me, so I made my donation. I was a bit afraid that this would be a part of their missionary work, but that was not the case at all. I can't say that I'm a perfect eco-friendly citizen, but I feel that I've been able to do my small part through this movement. 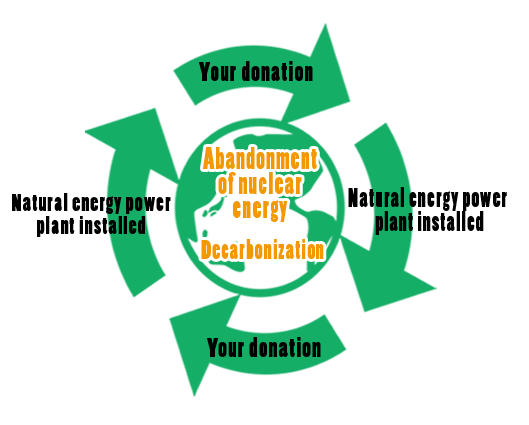 I heard from a fellow SNI member at my Fukushima Truth of Life Center that there'll be a green energy facility in my area, so I made my donation with my family. Especially after the 3.11, the energy problem is not somebody else's issue, so I hope that not only the SNI members but also non-members take it to heart and join this movement. Nowadays abnormal weather conditions due to global warming are causing frequent disasters all over the world. Food production is not increasing, and many species of animals and plants are facing extinction. Under these conditions the key to curtail global warming and lessen the damage produced by climate change lies in the expansion of natural energy and greater efficiency in its use. Throughout the world 164 countries have introduced such support measures as setting up target goals for the implementation of natural energy standards. Electric power facilities based on natural energy sources were estimated to account for 27.7% of the total electric generation capacity in the world and to reach the scale of 22.8% of worldwide electric power supply to meet electric demand as of the end of 2014. Solar power generation, accounting for 0.9% of it, is 177GW, showing a 48-fold increase in a decade. On the basis of the 2015 Paris Agreement, the use of natural energy resources has gained momentum worldwide. The capacity of the facilities for solar power generation increased by 50% in 2016, surpassing the growth ratio of facilities operating by fossil energy. The International Energy Agency (IEA) forecasts that by the year 2022, electricity generated by natural sources will amount to 30% of the total world energy. In Japan however, as if forgetting the lessons from the Great Eastern Japan Earthquake, there is a strong movement to be seen trying to keep alive the "old civilization" under policies that place their priority on the economy, relying on nuclear power generation and fossil energy. In 2014, total electric power in Japan consisted of thermal power generation (87.8%), hydro-power generation (9.0%), geothermal power generation and new energy (3.2%). In August 2015, the Sendai No. 1 Nuclear Power Unit restarted operations. The situation is such that we fall short by far of being a sustainable society. The total amount of electric power in Japan in 2016 consisted of: thermal power generation 83.4% (30.8% of which corresponding to coal-fired thermal power); hydropower generation 7.6%; solar power generation 4.4%; other natural energy sources 2.6%; nuclear power generation 1.7%. With nuclear power plants resuming operations, plus the expansion of coal-fired thermal generation, as well as their intended exportation, the situation is such that, by far, we fall short of being a sustainable society. We who live today must reflect on what our way of life will leave to the next generations. The legacy of the "old civilization" is a massive amount of greenhouse gas emissions in the atmosphere, harsh climatic conditions, degraded soil and ecological systems, and harmful nuclear waste: all of which poses a risk to life. Seicho-No-Ie thinks that human society can, by changing this and making full-scale use of natural energy, accomplish the "abandonment of nuclear power generation" and "curtailment of global warming", and achieve a way of life in which nature and human beings are more in harmony. Based on this belief, Seicho-No-Ie has moved its International Headquarters to the "Office in the Forest" (Hokuto City, Yamanashi Prefecture), completed in July 2013, and it operates the office compound with "carbon zero" technology, with no emissions of greenhouse gas. Almost all energy used for office work and commuting is done by simultaneous use of solar power generation (470kW), biomass power generation (175kW), and lithium ion battery (400kWh). In this way it is possible, by using state-of-the-art technologies, to accomplish a way of life that leaves no "negative legacy" to future generations and moreover, to free ourselves from a materialistic lifestyle. The most important and urgent issue is, in particular, to change rapidly the major energy sources of human civilization into natural energy in order to reduce the number of victims of disasters and preserve the fertility of nature. On the basis of this idea, Seicho-No-Ie is widely raising contributions, not only from its members but also from people with common interests and aspirations, to set up an international project of power plants that make use of natural energy. In 2015 we established a mega solar power plant with a generating capacity of 1,704kW in Kyoto Prefecture. 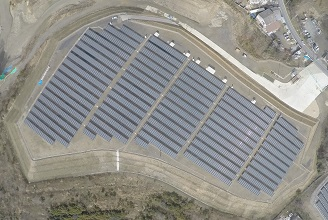 Subsequently we installed a 771kW solar power plant in Fukushima Prefecture, an area that has seriously suffered from the nuclear accident and which aims at creating a society which does not rely on nuclear power generation, by making active use of renewable energy. In addition, we have decided to set up a geothermal power plant with a generating capacity of 50kW in Oita in 2018. Your cooperation with Seicho-No-Ie Natural Energy Expansion Movement will be highly appreciated to attain a future society in which nature and human beings grow together. Your cooperation with the Seicho-No-Ie Natural Energy Expansion Movement will be highly appreciated to attain a future society in which nature and human beings grow together.